With Labor Day just about here, the last hurrah of summer approaches. School will be back in session, and soon the routine will go from one of swimming and sunshine to books and buses. Before we head out of the sunshine officially, though, I say you give it a proper sendoff, one worthy of the relaxing beach reads and lazy afternoons it provided you. Cheeseburgers are classic grilled fare around these parts, and I’m guessing they’re probably classic fare around your parts as well. Do you know what makes the perfect juicy burger, though? It may not be what you think. 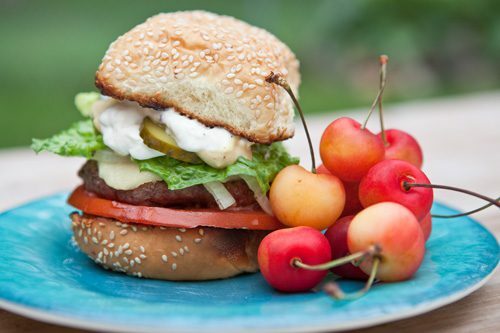 Here are a few tips on how to grill up a summer farewell burger. Choose a ground beef that is around 85% lean. Too much fat and you’ll get too much shrinkage as the burger grills, and too little fat and you’ll end up with a very dry burger. Pat your patties about 5/8″ thick and slightly larger diameter than the buns you’ll be serving them on, handling them as little as possible (very important not to smash and let the ground beef get warm). Remember that the meat will shrink some during cooking, and so you want to make sure your burger fills the bun. Do not season them at this stage. Preheat your grill and clean it. Once your grill is hot, place the burgers on the hottest area and grill for 4 minutes. Flip them to a medium temperature area and season with your desired seasoning or good ol’ salt and pepper. Add your cheese. Continue to grill for another 3-5 minutes to allow the meat to finish cooking to your desired doneness and for the cheese to melt. Remove from heat and place a tented piece of aluminum foil over them while you toast your buttered buns. (Toasting your buns may be optional to some, but it helps the bun stand up to the burger juice, as well as all of your fixings. Place your patties on the buns and adorn as desired. We always offer up lettuce, pickles, onions, tomatoes, ketchup, mustard and mayonnaise. Some of my other favorites include sauteed mushrooms, caramelized onions, horseradish, and fried potatoes.